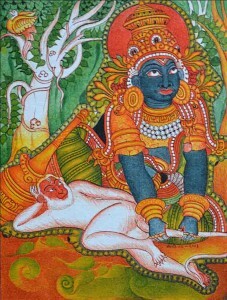 Draupadi asks Bheema to fetch her the divine lotus. Bheema, eager to please his wife, embarks on a journey to find the precious gift. On his way, he meets an old and frail little monkey. Little did he know, it was his brother the mighty lord Hanuman. Listen to this delightful story which connects the two great epics of India, Ramayana, and Mahabharata. Subscribe to the podcast on iTunes and receive automatic updates.